The DTEA1135 series of AC/DC desktop power supplies provides up to 150 Watts of continuous output power. All models have a single output and a wide input voltage range of 100~240VAC. This series is RoHS and Energy Star/CEC Level V compliant. All models have over voltage, over current, and short circuit protection. 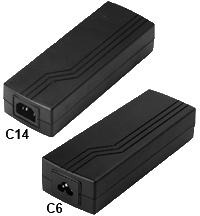 This series also has two AC inlet connector types available: IEC-320-C14 and IEC-320-C6. 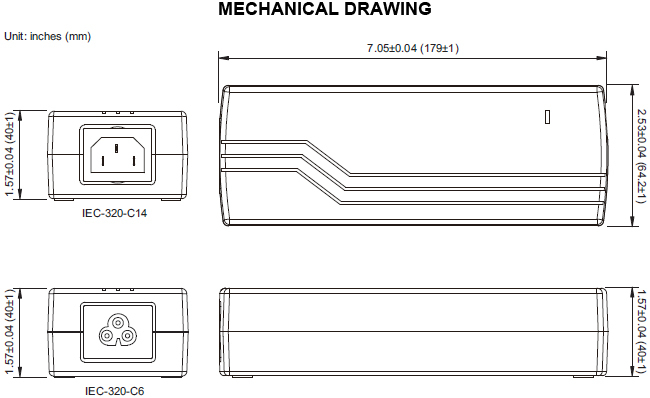 Optional output connectors are also available please call factory for ordering details. Notes: 1. The number in red represents the type of AC inlet: “1” is for IEC-320-C14 type and “3” is for IEC-320-C6 type. 2. The output voltage is specified as a range (Ex: 15 ~ 24VDC); the customer must specify what they want the voltage set at. 3. Ripple and Noise is measured at nominal line and full load with 20MHz bandwidth and a 0.1µF ceramic capacitor and 47µF aluminum capacitors in parallel. 4. Line regulation is defined by changing ±10% of input voltage from nominal line and rated load. 5. Optional output connectors are available. Please call factory for ordering details.